For other uses, see Brava (disambiguation). Brava (Portuguese for “wild” or "brave") is an island in Cape Verde, in the Sotavento group. 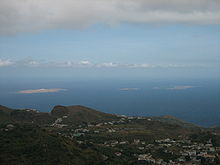 At 62.5 km2 (24.1 sq mi), it is the smallest inhabited island of the Cape Verde archipelago, but at the same time the greenest. First settled in the early 16th century, its population grew after Mount Fogo on neighbouring Fogo erupted in 1680. For more than a century, its main industry was whaling, but the island economy is now primarily agricultural. Brava was discovered in 1462 by the Portuguese explorer Diogo Afonso. :73 There is no evidence of human presence on the Cape Verde islands before the arrival of the Portuguese. Around 1620 the population of Brava started with the arrival of settlers from Madeira and the Azores. Settlement of Brava took a rise in 1680 when it received many refugees from the nearby larger island of Fogo after its volcano erupted and covered the island with ash. 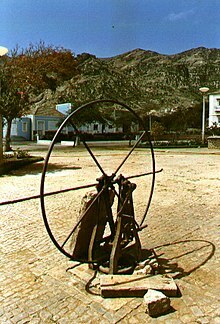 :83–84 Frequent pirate attacks forced the population towards the interior of the island, where the town Nova Sintra was founded around 1700. The uninhabited islets Ilhéus Secos or Ilhéus do Rombo with parts of the town of Nova Sintra. Being highly mountainous this island has a quite diverse climate. Brava island has moderate tropical climate (As according to Köppen–Geiger climate classification system) along the coast and semi-arid mild tropical climate Bsh with very balanced temperatures year round in the interior. The average annual temperature on the coast is about 23–25 °C (73–77 °F), decreasing to some 17–20 °C (63–68 °F) in the mountains. There can be remarkably cool weather with warmer wet season starting in June and ending in November with colder dry season starting in December and ending in May. Administratively, the island of Brava is covered by one municipality, Concelho da Brava. This municipality consists of two freguesias (civil parishes): São João Baptista and Nossa Senhora do Monte. The municipal seat is the city Nova Sintra. In the 1830s, the population was estimated at 8,000. The economy of the island is mainly based on (irrigated) agriculture and fishing. Main agricultural goods include coffee, potatoes including sweet potatoes, corn (maize), banana and sugar cane. Nova Sintra, a town with a museum, traditional Portuguese architecture, several churches and shops. Fajã de Agua, a small harbour on the West coast with a natural swimming pool. Nossa Senhora do Monte, a village in the mountains with a pilgrimage church. Cova Rodela, a village in the mountains with a dragon tree in its main street. There are several football clubs on Boa Vista, organised in the Brava Regional Football Association. "Aluguer" bus in the village Nossa Senhora do Monte. The Esperadinha Airport, inaugurated in 1992, was closed in 2004 because of persisting strong winds. The village of Furna has a commercial port, the other port is Fajã de Água which is only used for fishing. Ferries to the islands of Fogo and Santiago depart from Furna. On Brava the villages may be reached by "Aluguer" bus. There is no fixed schedule, as the aluguers travel only when there are sufficient passengers. A few taxis are available as well. Eugénio Tavares, musician; he used the traditional morna and wrote in Cape Verdean Creole. A statue dedicated to Eugénio Tavares is in the main square of Vila Nova Sintra, surrounded by a garden with trees, sunflowers, flowers, grass and other types of plants. Vinny deMacedo - Massachusetts State Representative & State Senate candidate was born in Brava. ^ a b "Brava – sua situação geográfica" [Brava, its Geographic Location]. A Semana (in Portuguese). 31 March 2004. Retrieved 10 February 2017. ^ "Climate Cachaço". Climate-Data.org. Retrieved 28 December 2013. ^ "2010 Census results Brava". Instituto Nacional de Estatística Cabo Verde (in Portuguese). 24 November 2016. Armand d'Avezac; et al. (1848). "Brava". Îles de l'Afrique. Paris: Firmin Didot Frères. pp. 208–210. Wikimedia Commons has media related to Brava (Cape Verde). This page was last edited on 5 February 2019, at 01:50 (UTC).